Change it to " Target's Resistance to X become 0% for 30 seconds" and please, change skill colours of that debuffs -.-"""""""""""
P.S: When u will do something for mall BALANCE?? Edited by Kazara, 12 November 2014 - 09:33 AM. Well the plan is the target resistance to X become X for 30 seconds is pretty much what's its going at. change skill colours of that debuffs -.-"""""""""""
Yup! That's been done and will go in 173. Class balance is a very tough part of the game. There is never a time when the game is fully "balanced'. Even games with multi-million dollar companies such as Blizzard, SquareEnix, Riot will teak their games to get as close to balance as possible. It's even harder in the MMO genre as new items, levels, encounters will always change how everything is balanced. Class balance will always be something we will be working on. We are coming up with some neat ways to find ways to make the game more enjoyable without malls. This of course will take some time because of how dependant this game has gotten with it's current system. Edited by Kazara, 12 November 2014 - 09:59 AM. and did you ask Helium to make Holy Bliss a party buff? Edited by explicid17, 12 November 2014 - 11:08 AM. well thats not ENTIRELY accurate. My druid is running 80% cap stack on all but wind/curse ~60%, until i swap to necklace and cap stack that as well. My prot is running 80% cap stack all but wind and curse, caps easily with necklace as well. You forgot that any toon running high int is running over 50% base resist. 85 set gives cap stacked elec. Now take for example the new enchants and new armor in the game. Regals instead of event scc gives you fire resist. boom cap all but light. which is currently a useless resist because there is 1 avenger in the game? what you see here is my Paint Art and some sort of nature Enemy Build: Both Races can suppress each other. The Xeona can cancel out the natural gifts from the Kruxena Race but have to suffer on the Short Range Battle for that. My Point is that the Xeona Race is not very good balanced and not only VS Kruxena. No a Pet or Traps with 3 Sec Duration can`t compensate that. Ofc. you could always say its the Work of the remaining other Races/ Classes to fill that Gap. So 1 OP Class like the Druid is no Fix for that. Giving them more movement ability won`t change much stunned or hushed.. But otherwise the Elementalist need to fill that Gab into my Eyes. Edited by Sandyman, 12 November 2014 - 11:40 AM. 1) spammable trap that does decent dmg, say guided with 2 sec cd and ability to have 4-5 up at the same time. 2) detonate on command function - sometimes you dont want it to blow up with just 1 person over it, you want it to wait for more to be on it. 3) more bombs - nuclear bomb/radiation bomb that does dot, a slowing bomb, a debuffing bomb. they are bomb specialists they should act like it. ANYWAYS off topic this was regarding elems. well did you know the lvl 80 elem skill removes hush but cant be used during hush? kinda silly right? should be castable in hush. If you see em fight lets say 10 Battle Rounds? Edited by Sandyman, 12 November 2014 - 12:23 PM. They need to improve the damage on the melee druid inferno skills and I would think Avenger should be more focused short range, not Ranger, but some melee skills in 1st job Hunter class would help i guess. Edited by explicid17, 12 November 2014 - 12:51 PM. also thousands? with 70% forge free +30 items. with 64% forge 1 +30 item is 2.5k mall, 5 items for 12k mall = 100 dollars. 6 armor parts, ball, 1tb necklace 7 items 200 dollars. or free if you have a ton of foc points. Edited by Apollonia93, 12 November 2014 - 01:04 PM. but what is left from the Old Concepts? does we ever see a real Front Line? I see Healers fighting Juggy solo easy and Tanks Healing at Raids thats some twisted Reality here. 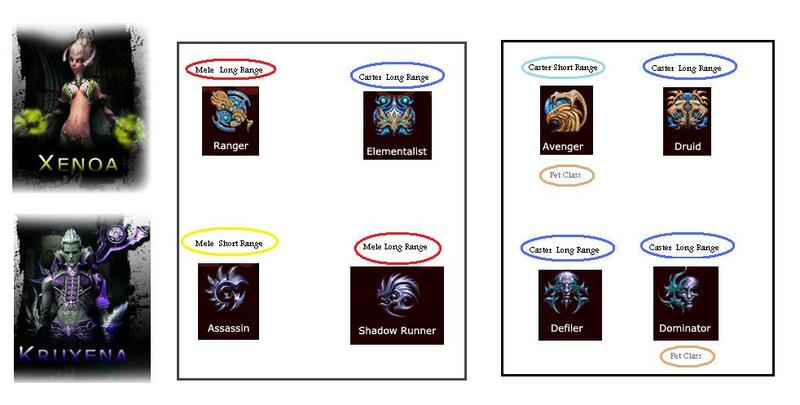 In the past we had some clear Rules...AoE or Solo DPS Class. now its all mix-ed up. I´m just saying go all the Way and not half backed like its now. Edited by sleepyTown, 12 November 2014 - 03:46 PM. That's a pretty funny assumption. All it takes is a trinity weapon, a scad ball and a tb neck or belt. Those are pretty easy to make with forge, and in fact just having them makes you a lot better than most characters your armor and jewels can be a bit lacking. I have been thinking that the resist down for elementalists should be a single skill(instant cast or passive) that reduces the target's MAX RESISTANCE by a value like -30%. This will mean that no matter how much resist they have, it still has an effect that isn't too overpowering. Right now, if the target has say... 150% to all resistances(capped at 80%), a -50% will do nothing to them. If it reduces the target's max resistance, it will set the target to 50%. If the target already had less than 50%, it will simply do nothing to them. Buff Bot. Lol. Oh, I feel depressed now. But thank you for the feedback! Very much appreciated to know what's being discussed! For pure PvE, that's pretty much what that class is right now. Guildy makes fun saying now I will have Rage of Bugs, and I'll be able to do damage. That, mind buff, hp buff for others, and fire res down is how he sees the use of my char. So, usually end up playing Buff Bot and using another toon for damage.You summed it up quite well. Anyway, sounds much better! Hope Helium's spark grows! Really long post because Alteris likes to see why/logical reasoning, which is understandable. But for others, just read the summary. Will probably suffice. Combine the four debuffs into two debuffs if you refuse to just make it into one. Add 10 more skill points if you're going to be adding skills or making people go through more filler skills to get to nicer skills in every class. Why is the Elementalist visualized as a single target class? Now if you could put 2 element debuffs on one skill, I think that would work better. Mainly I say this for skill points if instant cast (not caused by DNA! The visual effects make it slow!). Just look at skill trees. It is unreasonable to add 7 new skills that are supposed to balance a class without adding more base skill points or something. Even if you just use 3-4 of them, they all need maxed. It is defeating the purpose by using the same system and required amount, but then adding more variety to strengthen it. It's like, "Here's more stuff to play with to make the game better! Oh, you, you actually wanted to use them and make the character your own? Silly Temperion." Because look, let me even be conservative about it and just put pure necessities for PvE and PvP. 109 total pts @ lvl 90 – 89 = 20 pts left over. OH, minus 10 because I was told to max Rage of Bugs so I can do more damage while buffing and debuffing. And it’d either be another res, RoB, or clairvoyance. So even using just one debuff, I have only 10 points to actually play with. Well we want a little multi-target damage because it takes forever to kill a group of mobs. This might take 5 seconds off, but it's worth it. So HCl Throw and Mysterious Storm 5 each. Or if you make mysterious storm worth it, all 10 points in it.Oops! Out of points. Crap, won't be able to see sins now or have a single point in a spam skill when mobs/characters are too close. You have MAX! 20 pts to spend outside of absolute necessities. There’s hardly any flexibility to make this class your own. Do druids have it even worse with how many skills you have to use just to get to the one you want? Not sure. See what I’m saying? There’s not enough points for what you’re adding and what you’re wanting to do for the classes. The design is defeating itself before it is even implemented. Yes! The dash and armor mastery make it better. The class is squishy and can’t escape hush death, perma stun, etc or even keep up with others while traveling on rex with the others on foot. The instant cast and damage for res buffs would definitely make it better. You mentioned single target. Why not just make the res debuff like a splash effect multiple target? That's been mentioned somewhere. Not sure on its practicality. But if you keep adding skills to people's trees. I think 10 more points should be built in and/or earned (not mall). And with or without that, I think to balance this out, you need merge the stuff into two debuffs.One Fire/Elec, the other Water/Wind. Two debuffs for at least one item on another scad ball. Also, most of the useful BM/ele dmg dealers lie in Fire/Ele damage it seems now. Even with my conservative starter build, that still leaves me with only 10 pts to play with, but at least it's a more useful 10 points I spent in a debuff/possible instant damage dealer. Additionally! Question! Why is the Elementalist visualized as a single target class? I mean, it doesn't significantly hit harder than the multi-mob classes. Others can hit about the same if not the same or more and also lay down AoE's on top of that, which does damage much more quickly to many more morebs/opponents. So I don't really see much of an advantage except for slight variety and not causing others to lag. Perhaps if the few multiple target skills available actually did damage like an echo of total AoE damage? specifically, I mean instant damage to a large group of mobs/players. 30 Mystics even on full +30/res cap seem to hit about 3k per tick on AoE. So 8 ticks * 3k = 24k. Well, +30 elementalist should have Mysterious Storm cause 5-7k dmg, Haven't decided. Even at 7k,not quite 1/3 of total damage what a good AoE causes. You easily get that much damage from just running out of an AoE. Mysterious Storm, I think that would be a good one to do that to. Makes the ele a little more special for both solo pve, TD, and PvP. I don't see how a puff of air visual effectis that mysterious or very storm like. Max I ever hit on that at end game with great gear and pd Alban II mobs is a 3k or maybe a little over. Usually hits around 2k on those in SvS though I think. The mind buff, it really is stupid you can't use it during hush. Hush happens by multiple target. Well, you're usually alone or in a group, so, not sure how you're not supposed to be hushed yourself unless you just ran into a group of hushed players. Edited by XRosebloodX, 15 November 2014 - 09:04 PM. make the -res debuf reset players max resistance to the resistance cap if they are over it and then apply the debuf. Edited by sonemere, 15 November 2014 - 02:04 AM. Just FYI, not sure about how long most ppl here have been playing but when they originally introduced the Reduce Res, it was 1x skill to reduce ALL res and was instant cast will a long cool down - problem with it was that with max skill + max DNA the most it reduce was approx 15% - to which at lvl cap + gear barely gave an additional 150 - 300 additional dmg........ hence why almost every Ele build avoided this skill all together and focused more so on the dmg side..